? ?This is the first in a series of shots I'll be posting on Flickr from an hour or so I spent at a little Catholic school in a Dan Toc Village. Technically I wasn't even supposed to be there... I slipped past the guardhouse which keeps foriegners out of the village. The government there doesn't want people bringing money into the developing area (mostly through the church)... they would much rather have you give it to them and have them... um... "disperse" it for you. Yeah. Bastards. Anyhow, there were kids there from about 1 year old through maybe 8 or 9, and it is basically a place where the parents can drop off the kids all day and they are fed and educated... and the only "catch" is that they learn Catholicism as well as the rest of their studies.Dan Toc is what the people the world knows as Vietnamese call the "natives" of the country. 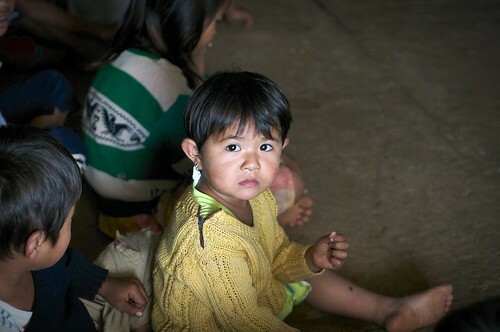 There are other names for them, and each tribe has their own name, but basically they are the "mountain people"... and until recently have remained segregated from "civilized" society in Vietnam. I won't go too much into the politics and history here, there is plenty of info on the net...So... I went to this school to photograph the kids... some were shy and some were playful... all were curious. Since foriegners are not allowed into the area, most of them had never even seen one. I realize that I am half Vietnamese... but I don't look it. Not one person in Vietnam saw me as anything but a foriegner, sometimes to my benefit, sometimes not. So I shot a bunch of photos, talked to a couple kids, and took off when it was nap time.